You've seen The Princess Bride, haven't you? (If you haven't, you need to go do that right now. And read the book too while you're at it.) Looking at Gedifra's designs recently I was reminded of Vizzini crying out, "It's...the Cliffs of Insanity!" Only in this case it was me yelling. And it was "It's...the Embellishments of Insanity!!" Observe how embellishments can transform ordinary knits. 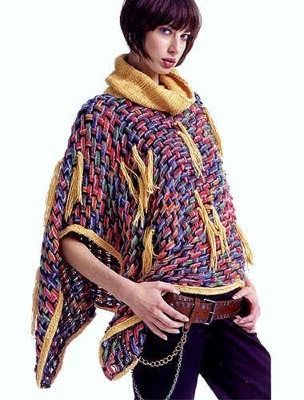 Take one fairly ugly poncho. Add a cowl, a very large belt with chains (so punk) and random tassels, et voila! It is now completely ugly. Take a dull, lumpy, sweater dress and slap some doilies on it (and a belt). Now it's "Blondie meets Granny." Why make boring classic sweaters when you can liven them up with big, pointless braids? And a belt. Mustn't forget the belt. You don't even have to knit it! Take a nice textured knit jacket. Now throw in some gigantic fun fur cuffs (are they even attached to the sweater?) and a button-crusted belt. It's office chic with a little cavegirl Victoriana thrown in. It's amazing what some out of scale buttons and winning the Super Middleweight championship can do for a plain mohair sweater. Remember folks, when in doubt embellish it. Then add a belt!